Luis: Is this kidnapping or robbery? El Chivo: It could be the last day of your life. An automobile speeds chaotically through the streets of Mexico City while its occupants attempt to evade certain death from a pursuing truck. In total desperation, they cross an intersection during a red light and cause a devastating accident. Why were these young men being chased? If anyone survives, what are the lingering effects of this event? Does this crash affect any onlookers in an unexpected fashion? Amores Perros provides answers to all of these questions in compelling fashion with remarkable precision and energy. Writer Guillermo Arriaga Jordan and first-time director Alejandro Gonzalez Inarritu have crafted three intriguing stories connected through the brutal crash. The story begins with Octavio (Gael Garcia Bernal) and Susana (Vanessa Bauche)�two young lovers with plans of running away together with his recently acquired wealth and her child. There's one major problem: she's married to his brother Ramiro (Marco Perez). This self-centered bully spends his days exerting control over his wife and brother and robbing convenience stores. Utilizing the fighting skills of his dog Cofi, Octavio has garnered a large amount of money through these cruel battles. Unfortunately, his plans may be nixed through an unwieldy combination of bad luck and betrayal. This film opens with a frenetic pace that energizes you and leaves few chances to catch a breath. In one sense, Inarritu's terse direction mirrors the path of Octavio's life, which is quickly moving beyond his comprehension. This atmosphere contrasts sharply with the story of Daniel and Valeria, who have settled into a supposedly tranquil domestic life. He has divorced his wife and left the children to pursue a new relationship with young Valeria�a gorgeous and world-famous supermodel. With one swift stroke, the crash destroys her career and renders her helpless and frustrated. The pace of this section remains fairly slow and deliberate, and this speed corresponds with the nature of Valeria's new predicament. Away from the excitement of the fashion world, she spends her time reading magazines and playing with her dog, Richie. Daniel and Valeria's troubles may lack the velocity of the first segment, but the emotional torment is even more difficult and draining than Octavio and Susana's story. Throughout this feature, quiet interludes present the life of El Chivo (Emilio Echevarria)�a grizzled former guerilla who now works as a hired gun. With only a devoted group of stray dogs as his companions, he strolls the streets and observes his estranged daughter. Although he speaks few words until the final act, El Chivo's plight is the most engaging and really carries the emotional aspects of the film to greater heights. His situation may not be entirely sympathetic, but Echevarria sells the character with the excellent use of complex facial expressions. Even hidden behind a thick beard and mustache, his feelings of loneliness and love for his daughter are evident. The story closes with El Chivo and reveals a troubled man still grasping for any type of connection on this Earth. This movie features a wonderful collection of actors who make each character believable and help to create fascinating cinema. The standout is Echevarna, who exhibits a poignant, human nature in El Chivo that generates several classic moments. Gael Garcia Bernal brings a fresh exuberance to Octavio's unflappable love for Susana that makes his naivete touching. Marco Perez exudes plenty of sliminess as the callous Ramiro, and Goya Toledo provides significant depth beneath her attractive physique. The entire cast takes Jordan's effective screenplay and provides additional weight to each role. Amores Perros utilizes a three-tier structure and time shifts in the vein of Pulp Fiction, Go, and other imitators. However, there is nothing gimmicky or repetitive about this story. Each person possesses hopes and dreams that draw much more interest than the style and techniques. This method does increase the effect of each tale by providing a focus on a specific relationship. Instead of jumping around and alienating us from their plight, the camera provides a unique concentration that leads to a difficult, engaging tale of the troubles inherent in each type of love. Image Transfer Review: This release utilizes a 1.85:1 widescreen transfer that provides an impressive visual experience throughout its lengthy running time. Lion's Gate deserves credit for giving this film the premier treatment that it deserves. The black levels are solid, and the images remain bright and clear. Although it does provide a well-done picture, it is a surprise to see a nonanamorphic transfer for a release of this magnitude. It is the only drawback of this disc and is noteworthy even given the quality of the visuals on this film. Audio Transfer Review: Amores Perros features an excellent 5.1-channel Dolby Digital Spanish transfer with impressive complexity. The track wonderfully utilizes the rear speakers to create a deep surround experience. During the vicious dog fights, the background noises mix nicely with the essential sounds and create the feeling of being inside the bloody circle. The songs blare powerfully from the speakers with force and conviction, and this increases the strength of the story. This track presents audio elements from all sides of the room and ranks as a top-notch transfer. This disc also includes a 2.0-channel French stereo transfer, which also creates an effective sound without the same level of complexity as the Spanish version. Extras Review: Although not listed as a special edition, Amores Perros contains a decent collection of supplements that could warrant such a designation. The most prominent feature is an intriguing commentary from director Alejandro Gonzalez Inarritu and writer Guillermo Arriaga Jordan. Both speakers provide plenty of essential information into their overall thought processes and the ideas for each scene. The track is recorded in Spanish, so English viewers will have to read the comments from the subtitles. However, this did not detract too much from my enjoyment of this feature. Inarritu speaks very honestly and even addresses the pace problems in the middle story of the film. He also relates an interesting tidbit about crew members being robbed at gunpoint during location scouting. Jordan intricately discusses the complex structure and his views on each character. It's also noteworthy that certain moments stemmed from his own life, including owning a killer dog. This disc also contains a nice collection of 12 deleted scenes with commentary from Inarittu and Jordan. All of these moments look fine and would serve the story well, but time and pacing concerns caused the cuts. Several scenes provide more appearances for Susana's mother and star Andre Salgado. There's also a slightly different ending. Although it only runs for about 16 minutes, this section was extremely valuable in showcasing the editing decisions necessary when creating a film. The other major section has three featurettes that provide an impressive behind-the-scenes look at the production. The longest one runs for about 12 minutes, and it includes interviews with Inarritu, Goya Toledo, and Emilio Echevarria. This piece offers plenty of shooting footage, and the comments provide a good overview. The other two featurettes cover specific elements of the story. The 3-minute car crash segment briefly presents the difficulties faced in shooting this destructive scene. Inarritu utilized nine cameras for this scene, and the timing had to be perfect. The final item shows a 6-minute peek into the shooting of the vicious dog fighting. Surprisingly, many of the battles were shot with only one dog at a time. When both were needed, special muzzles saved them from injury. This disc also features three music videos that address the film's dour subject matter. Julieta Venegas' Me Van A Mater is a heartfelt love song that contains shots from the movie. The music is pretty dull, but it does showcase some interesting black & white images. Cafe Tacuba's Aveientame is a sad love song that utilizes a nice mixing of visual perspectives. Finally, Control Machete and Ely Guerva present Amores Perros de Perros Amores�a rap tune with a refrain sung by a melodic female vocalist. This is the craziest video of the three, with odd colors and mildly disturbing canine images. All three videos include English subtitles. 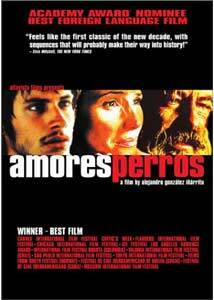 Amores Perros received nominations for Best Foreign Film at both the Oscars® and the Golden Globes® in 2001, and it deserves every accolade. There are so many sides of the story that it requires at least a few viewings to comprehend everything. Each major character could provide the subject for an individual feature film, and this complexity might have easily overwhelmed the focus. Instead, Alejandro Gonzalez Inarritu's debut film provides an essential experience that tackles the intense troubles of love without blinking an eye.